Pursuing or completed class 12th with minimum 60% aggregate. SC/ST/OPH: minimum 50% aggregate in class 12th. Born on or after 1st January 2000. Haven't pursued English, Physics, Chemistry and Biology in Class 12th. Candidates seeking admission to MBBS courses in the AIIMS institutes across the country must check the AIIMS MBBS eligibility criteria 2019. Aspirants must go through the eligibility criteria of AIIMS MBBS Entrance exam 2019 before filling the application form. The essential eligibility criteria for AIIMS MBBS Entrance Exam 2019, the undergraduate medical entrance exam of AIIMS, New Delhi are academic qualifications, citizenship, domicile, the maximum age, and the candidates need to fulfil all the eligibility criteria. Minimum Marks: The minimum aggregate marks in English, Physics, Chemistry, and Biology obtained in the qualifying examination should be 60% aggregate to satisfy the eligibility criteria for AIIMS MBBS 2019. Minimum Age: Candidates must be 17 years old as on the 31st of December of the year of admission (2019) to satisfy the eligibility criteria for AIIMS MBBS 2019. Qualification: Candidates should have passed 10+2 or equivalent from a recognized Board of any Indian State. Candidates who have appeared or are appearing in the final year of the qualifying Examination from a recognized Board/ University are also eligible to apply and appear in the Competitive Entrance Examination (CEE) for AIIMS MBBS 2019. However, their candidature will be considered only if they provide documentary evidence of having passed the Qualifying Examination, with the required subjects and percentage of marks for AIIMS MBBS 2019. Compulsory subjects: Candidates must have pursued English, Physics, Chemistry, and Biology as subjects in Class 12th to satisfy the eligibility criteria for AIIMS MBBS 2019. Requirements: Candidates applying for AIIMS MBBS 2019 must produce a certificate from the concerned Indian University/Association to certify that the candidate has passed the examination that is equivalent to the 12th class. Those with CGPA Grades only will have to apply the Conversion Factor in the AIIMS MBBS 2019 Application Form. Conversion factor: The Conversion Factor should be as approved by their respective Examination Board for AIIMS MBBS 2019. Criteria: Candidates born on or after 1st January 2003, will not be considered for the admission process for AIIMS MBBS Entrance Exam 2019. 10+2 or equivalent with physics, chemistry, biology, and English as an exam. Qualifying Subjects: To fulfil the AIIMS MBBS 2019 eligibility criteria, the candidate must have passed in Physics, Chemistry, Biology, and English. The aggregate of the marks for General and Other Backward Caste (OBC) candidates in Physics, Chemistry, Biology, and English in their Class 12 or HSC examination must be 60%. CGPA Applicants: Candidates with CGPA grades only have to apply the conversion factor in the AIIMS MBBS 2019 Application form. The Conversion Factor should be as approved by their respective Board of Examinations. 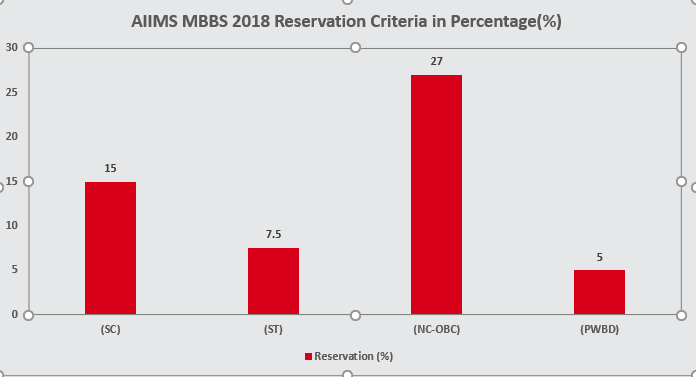 A Certain percentage of seats in AIIMS are reserved for Scheduled Caste (SC), Scheduled Tribe (ST), Non-Creamy – Other Backward Classes (NC-OBC) and People with Benchmark Disability (PWBD) candidates. Overseas Citizens of India Eligibility: Overseas Citizens of India (OCI), who are registered under Section 7A of Citizenship Act 1955, are eligible to apply for AIIMS MBBS 2019. The same terms and conditions applicable to Indian national will apply to OCIs. For being on the eligibility list for AIIMS MBBS 2019 exam, OCIs need to produce OCI registration proof under Section 7A of Citizenship Act 1955. Minimum marks: Foreign candidates nominated by the Government of India need to pass science examination or equivalent with a minimum aggregate score of 50% in Physics, Chemistry, Biology, and English. There is no need for foreign nationals to appear at Competitive Entrance Examination. This provision is applicable to AIIMS New Delhi only. Minimum marks: The foreign candidates nominated by the government of India need to pass intermediate science examination or equivalent with a minimum aggregate score of 50% to satisfy the eligibility criteria for AIIMS MBBS 2019. Compulsory subjects: The foreign candidates who are applying must have pursued Physics, Chemistry, Biology, and English to satisfy the eligibility criteria for AIIIMS MBBS Entrance Exam 2019. Examination Criteria: There is no need for foreign nationals to appear at Competitive Entrance Examination. This provision is applicable only to AIIMS New Delhi. The eligibility criteria for AIIMS MBBS 2019 differs between the students from India and the students from other countries. Thus to get elected in the AIIMS MBBS 2019 Entrance exam, the above-mentioned conditions should be met. Maximum number of attempts for appearing in NEET? There is no cap for number of attempts as stated in the official CBSE NEET website. I am currently studying the IB curriculum at an international school in India. One of the requirements for the AIIMS exam was transcripts for grade 12 final exams. However, my exams will only take place in May and the marks will only be released in June. Can I use my IB predicted scores to write the AIIMS entrance exam instead? Candidates who have appeared or are appearing in the final year of the qualifying Examination from a recognized Board/ University are also eligible to apply and appear in the Competitive Entrance Examination (CEE) for AIIMS MBBS 2018. However, their candidature will be considered only if they provide documentary evidence of having passed the Qualifying Examination, with the required subjects and percentage of marks for AIIMS MBBS 2018. To know the eligibility criteria in detail, Click Here. What is the AIIMS Eligibility criteria in terms of educational qualification? Candidates should have qualified 12th board or equivalent examination of 10+2 education system recognised by AIIMS Delhi. They should have also studied Physics, Chemistry, Biology and English as mandatory subjects in their 10+2 level. 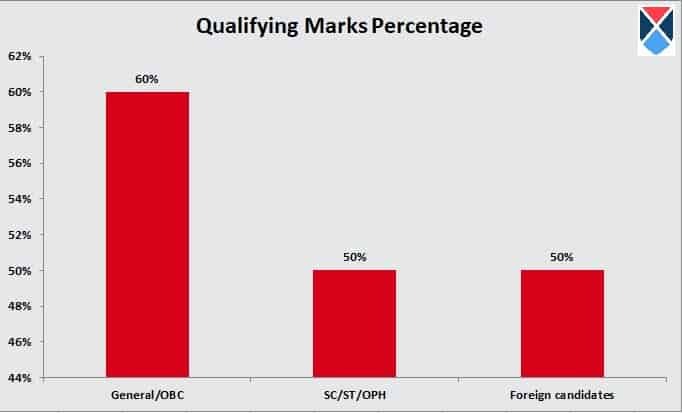 In addition to the above conditions, candidates belonging to General and OBC categories should have secured a minimum of 60% marks in the aggregate of aforesaid subjects and those belonging to SC, ST and OPH categories should have obtained at least 50%. What is the eligibility criteria for foreign nationals? To get the eligibility for admissions to MBBS program, the foreign candidates nominated by the government of India need to pass intermediate science examination or equivalent with a minimum aggregate score of 50% in Physics, Chemistry, Biology, and English. There is no need for foreign nationals to appear at Competitive Entrance Examination. This provision is applicable only to AIIMS New Delhi. Is there any reservation for reserved category students for Eligibility? What is the eligibility criteria for appearing in the exam? Applicants must complete 17 years of age before 31st December 2017 to get the eligibility. The applicants must hold a degree in 12th grade and equivalent from a recognized board with English, Physics, Chemistry and Biology as their subjects to get the eligibility. Candidates appearing for Class 10+2 in the year 2017 are also have the eligibility for the entrance examination. Overseas Citizens of India (OCI) who are registered under Section 7A of Citizenship Act 1955 have the eligibility to apply for AIIMS. The same terms and conditions applicable to the Indian students who will apply to OCIs. To get the eligibility for AIIMS, OCIs need to produce OCI registration proof under Section 7A of Citizenship Act 1955. There is no need for foreign nationals to appear at Competitive Entrance Examination. This provision is applicable only to AIIMS New Delhi.